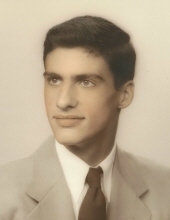 Chillicothe- Joseph “Giuseppe” Carmelo Zerbonia, age 83, of Peoria, passed away on Wednesday, January 30, 2019 at Heritage Health in Chillicothe, IL. Joe was born in on December 9, 1935 in Peoria, IL., a son of Michael and Conchetta (Controneo) Zerbonia. Joe was married to Catherine “Caye” McFarlane from 1960-1974 and they had 5 children. He is survived by four children; Joseph, Jr., of SC, James of IA, Steve of Peoria, and Regina Kennedy of Peoria, and one sister, Carmela of Peoria, as well as 6 grandchildren and one great-grandson. He was preceded in death by his parents, one son, Johnny, an infant sister, Teresa, two brothers, Vincent and Angelo, and one sister, Margaret. Joe graduated from Manual High School in 1953 and went to work at Keystone Steel and Wire. He proudly served in the US Army in the Korean War from 1957-1959, stationed in Germany. Upon coming back to the States, he returned to Keystone to work. In the 1980’s, he operated the Zodiac Bar on Glen Ave in Peoria. He ended his career at the Army Corp of Engineers as a lock and dam operator. Joe was an avid sports fan and had multiple TVs set up in his living room, so he would never miss a game. His favorite football team was the Green Bay Packers and favorite baseball team was the New York Yankees. Joe played both fast and slow pitch softball for over 50 years for various Peoria area leagues and was a standout player. Joe was known for always owning a Cadillac, or two or three. A Celebration of Life will be at 1:00 PM on Saturday, February 9, 2019 at Wright & Salmon Mortuary in Peoria. A visitation will be 2 hours prior from 11:00 AM – 1:00 PM also at the Mortuary. Per Joe’s wishes, Cremation Rites have been accorded. To send flowers or a remembrance gift to the family of Joseph C. Zerbonia, please visit our Tribute Store. "Email Address" would like to share the life celebration of Joseph C. Zerbonia. Click on the "link" to go to share a favorite memory or leave a condolence message for the family.